Chaves, Kelly and Walton, Oliver. Explorers of the American East: Mapping the World through Primary Documents. ABC-CLIO, 2018. ABC-CLIO, publisher.abc-clio.com/9781440839313. 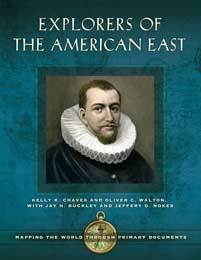 Focusing on ten key figures whose careers illuminate the history of the European exploration of North America, this book presents compelling first-person narratives that bring to life the challenges of historical scholarship in the academic classroom.